When a kitten appeared at an outdoor music festival over the weekend, there were no oohs and awws. Someone at the Craven Country Jamboree in Saskatchewan, Canada, had doused the tiny animal in alcohol and set her on fire. Fortunately, the horrified crowd acted quickly, putting out the flames and getting help. 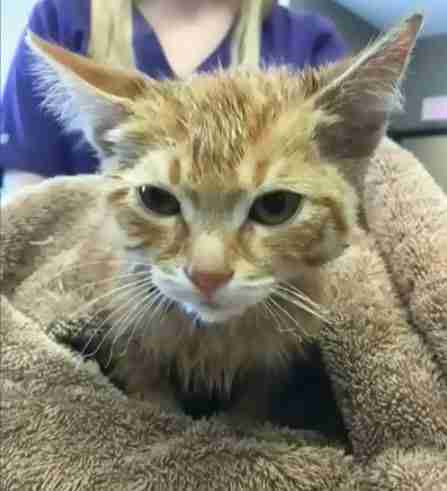 Police have since charged two people who attended the festival with animal cruelty, while the kitten is recovering at a local veterinary hospital. "She is stable and comfortable and being treated as though she was one of our own," TM'z Veterinary Clinic noted on its Facebook page. Indeed, this kitten, tentatively dubbed Jamboree, is already making a comeback, one sip of milk at a time. "This is a very isolated incident," Ted Munro, an inspector with the Royal Canadian Mounted Police, told the National Post. "I just think it's some idiot that made a bad decision, a really bad decision," festival marketing director Kim Blevins told the National Post. "And hopefully he'll pay for it." In the meantime, concert organizers say they plan on helping Jamboree find a home. "In all of our years in entertainment and working festivals and fairs, we have never experienced an incident like this," musician Bruce Williams said in a video posted to the event's Facebook page, adding the kitten "will become the official mascot of the Jamboree." If you would like to follow Jamboree's progress, visit the Facebook page for TM'z Veterinary Clinic here.